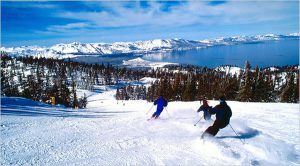 Dust off your skis and come visit Lake Tahoe. Ski resorts are reporting up to two feet of fresh snow this morning. We are up early in Lake Tahoe this morning enjoying the sunshine while digging out our cars and walkways. Many Thanksgiving visitors are heading home today so its the perfect time to take a personal day and enjoy the mountain. Expect chain controls over the mountain passes. Heavenly Mountain Resort: 9″ of snow in the last 24 hours. The resort will have 1 percent of the mountain open: 35/4800 acres, 5/28 lifts open, 5/97 runs open. Kirkwood: 14″ of snow in the last 24 hours. The resort will have 3 percent of their terrain open: 60/2300 acres, 3/15 lifts and 6/86 runs. Sierra at Tahoe: 16″ (base) to 24″(summit) of snow in the last 24 hours. They will have 4 lifts and 3 trails open.